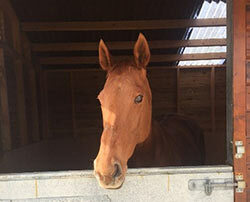 This year our horses have been sending Easter Cards to their sponsors and fosterers, so we would like to join them in hoping all our supporters had a very Happy Easter. If you would like to see the Jacquie Lawson card that Jazz has sent to her sponsors, please click here. 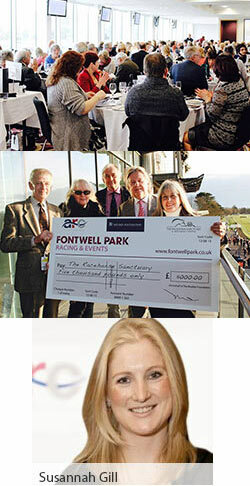 Our Charity Raceday celebrating both the 10th Anniversary of The Racehorse Sanctuary and the 51st running of the National Spirit Hurdle at Fontwell Park on Sunday 28 February 2016 was a great success. The weather was kind to us and just right for Winter jumps racing. As Co-Founder Graham reported on Facebook: it was a cracking day out! And a cracking result too, raising £23,000 towards the good work of the charity. Our thanks go to all our staff and volunteers, who worked so hard to ensure the day was enjoyed by all our guests. Special thanks go to Colin Brown, our ever popular tipster and master of ceremonies, who teased out some wonderful bids for the auction items on offer. Our very special thanks go to The Reuben Foundation for such generous sponsorship in the form of a cheque presented to us by Susannah Gill, Director of External Affairs for ARC Racing & Leisure Group. A big thank you to Kate, seen here riding her own 18-y-o Londoner, who won 6 races and was placed 9 times during his racing career. Kate has very kindly donated many super brand new rugs to our charity: medium and heavy-weight New Zealand rugs, together with light-weight and medium night rugs. She has also given us "Hot Horace", a life size model of a horse who will help out at our travelling charity marquee. 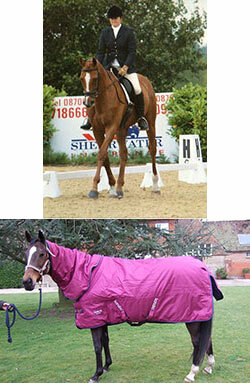 We are selling these rugs to raise funds for the charity: £50 for the New Zealand rugs and £20 for the night rugs. Please call the office at Stilemans, if you are interested - tel: 01483 428961: we can arrange delivery by courier at cost. From all of our horses, thank you so much for your generosity Kate; an unusual form of support but never-the-less very welcome. We reported last month about Graham’s use of social media to seek a foster home for Elegant Lady. With such success, that we can report that Elegant Lady is now living in the Garden of England with Cleo, who along with her mother, are very much into animal welfare, as they have eight rescue dogs from various countries. Elegant Lady is seen in this picture surveying her newly found estate, having just arrived at her new home. She is now settled down well in Kent, and all the signs are that she has already found her way into Cleo’s heart – an occupational hazard for fosters, we are afraid! Please keep the offers of foster homes coming in. You may have heard that the super 13-y-o Gary Moore trained chaser Fruity O’Rooney was recently retired from racing, having won 9 of his races and been placed in 19 others; click here for more details of his career. He is owned by the Heart of the South Racing syndicate and Anne Tyrrel, a member of the syndicate, has written his autobiography. Anne has very kindly donated 50 copies to our charity to either sell or put to auction to raise funds for the centre. If you are interested in purchasing a copy at £15 including packing and postage, please contact our Stilemans office - tel: 01483 428961. 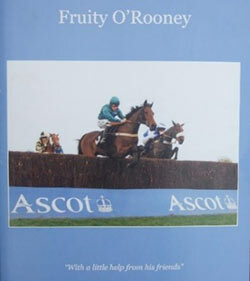 Fruity O’Rooney’s fascinating story is well told and the book contains some super action pictures; it really does makes fascinating reading. Our thanks go to Anne for her generosity and support, whilst our best wishes go to Fruity O’Rooney in his retirement. ARE YOU READY FOR A SPRING CLEAN THIS EASTER? We have recently had two welcome donations by way of the on-line scrap metal operation Giveacar. Does this prompt the idea of a spring clean around your house or horse? Have the kids left university leaving jalopies on your drive? Is there an old horse box, tractor or farm machinery at your livery, or in corner of your paddocks? Would you like an easy simple solution to clearing up the mess? 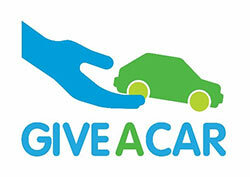 Simply call Giveacar on 0207 736 4242, e-mail support@giveacar.co.uk or go online here, to arrange free collection. You can donate some or all of the proceeds to The Racehorse Sanctuary and the horses will love you for it! A very warm welcome to two new members of our team. Julia has recently started at Stilemans as our Office Admin Co-ordinator. Julia was previously Racing Secretary for Olly and Hetta Stevens at Robins Farm and brings with her a valuable understanding of how racing administration works. Her induction into how the ex-racehorse welfare world works is being led by our long time stalwart Val, who has recently moved to London. The good news is that even when Julia is full up to speed, we will not have lost Val for good; she has promised to maintain her level of volunteer input, even if this is now more from a distance. In an exciting new development for us, the Trustees have engaged Catherine as a professional fund raiser for the charity. Catherine lives close to Stilemans and will be starting with us formally later next month. We are really looking forward to working with her; do not be surprised to get a call from her as she seeks to take our fundraising to a new level.